The weather has been hot, hot, hot this week. 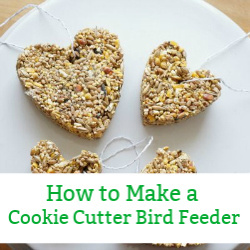 We’ve been looking for fun ways to keep cool outside. We don’t want to simply hide away inside when the weather turns hot…instead we want to find ways to safely enjoy ourselves. This past week my girls have been in camp at a local farm. When they get home at the end of the day they are tired and sweaty. 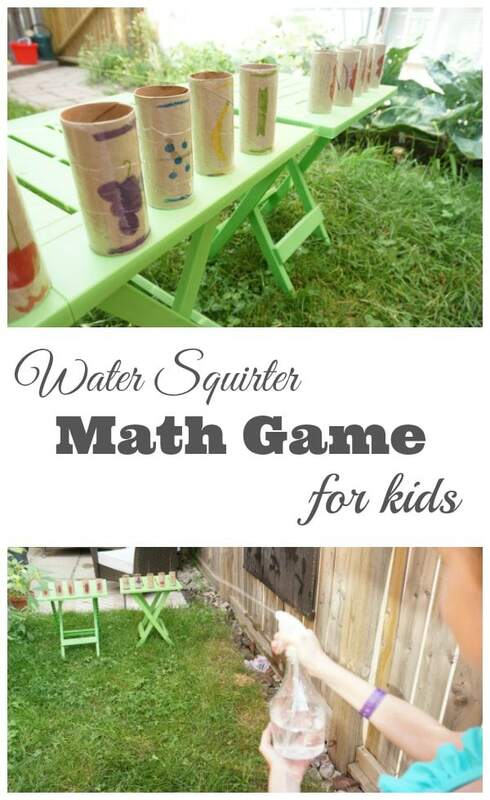 So, we created a super fun water squirter math game to play in our backyard. I love combining play, learning and getting outdoors. Here’s what we did. First, the girls collected and decorated 6 toilet paper rolls each. 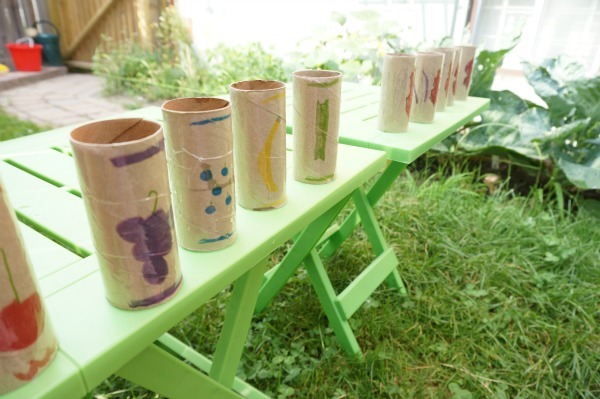 After they decorated their toilet paper rolls I wrapped them with clear packing tape….this waterproofed the rolls. 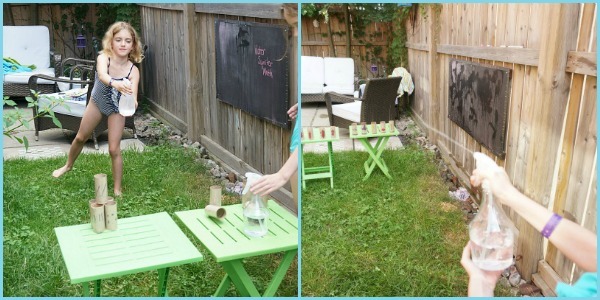 Next, the girls lined up the rolls on a couple of outdoor tables and filled their water squirters. We use water sprayers that are typically used to mist plants. When you adjust the sprayer, they shoot quite straight…I’m not a huge fan of water guns. How do you play the game? The girls took turns answering math questions, that I asked them. I asked my eldest daughter multiplication questions and my younger daughter addition questions. If the girls answered correctly, they get to try and spray down one of their toilet paper rolls. If they answered incorrectly, they were sprayed by their opponent. The first one to knock over all of their toilet paper rolls wins the game. 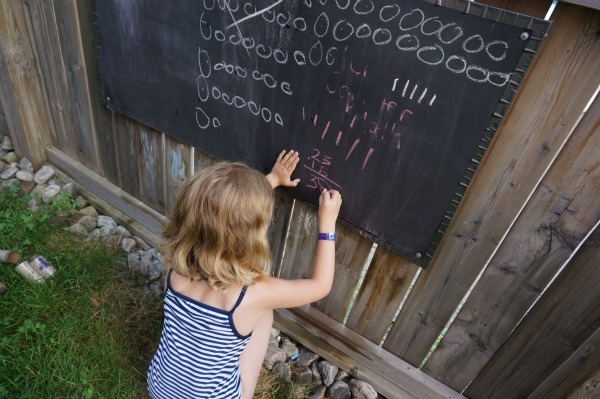 I even let my girls work the answers out on our outdoor chalkboard. 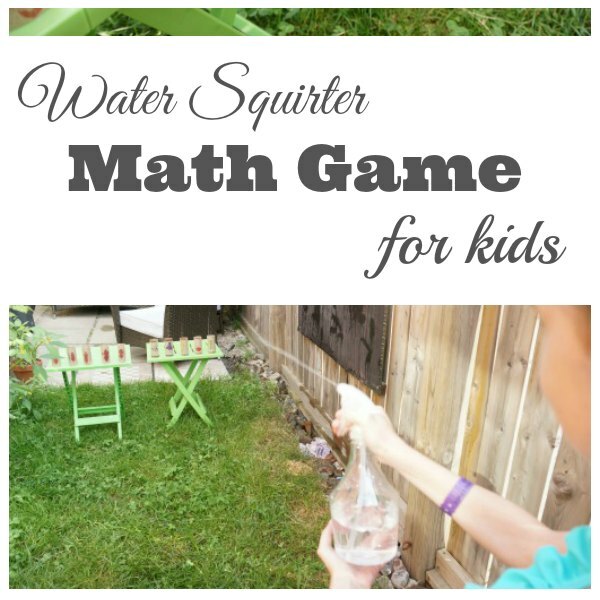 In the end, the game digressed into a simple water fight… which is always a great way to stay cool and have some fun. They are looking forward to giving this game a try again tomorrow night when they get home from their last day of camp. Looks like a perfect way to cool off. That looks great fun. 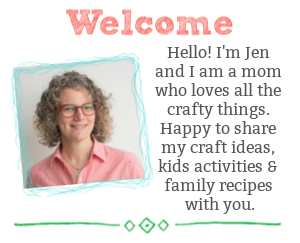 Thanks for linking up to our Parenting Pin-it Party. I cannot even tell you how much my son would enjoy this! Thank you for coming up (and sharing) with such a great way to enjoy the summer sun while keeping math skills sharp! 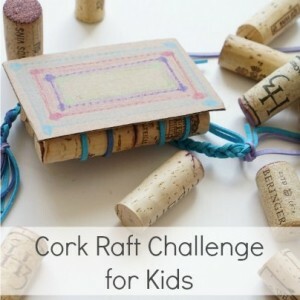 I’m featuring this tomorrow at the After School Linky Party. 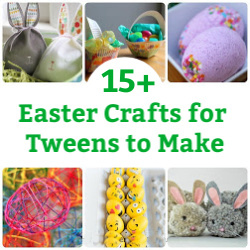 Stop by to check it out and share more of your amazing ideas! Thanks so much. It really is a lot of fun! I’ll be sure to stop by. Thanks for featuring our hopscotch! 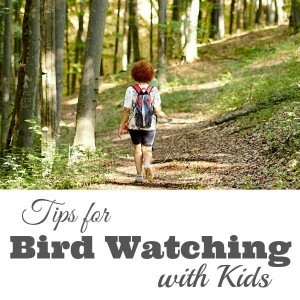 The kids are loving it….they’ve been out there every day! Love it, we have plenty of spray bottles and I like how you got a bit of learning in their too.